The Association for the Promotion of Social Products held its "First Social Products Awards" ceremony on May 16, 2013. 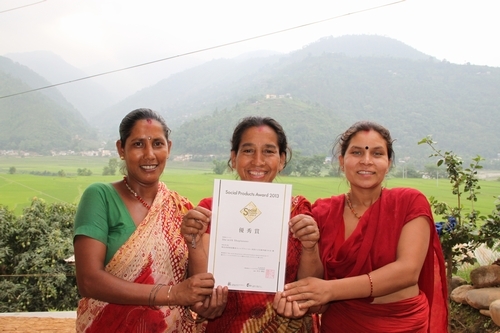 The winner of the award of excellence was a high-quality, fair-trade soap made from local materials and based on an Ayurveda recipe, hand-made by women in Bangladesh and Nepal, with the aim supporting the economic independence of women. "She with Shaplaneer" is the brand name of the high-quality fair trade soap, with its production using local or organically-grown plants based on Ayurveda recipes and marketing coordinated by Shapla Neer=Citizens' Committee in Japan for Overseas Support, a non-governmental organization (NGO). The project was applauded for its contribution to the independence of women, its support for local communities, its reduced impact on the environment in production processes, including on-site recycling and reprocessing, and its excellent packaging design. Shapla Neer, meaning the "house of water lilies" in Bengali, was established in 1972, making it one of Japan's first NGOs in the field of international cooperation, and has been active for about 40 years. This project has been supported by the Japan External Trade Organization through its Pilot Demonstration Projects for Development and Import Schemes, and the product development was completed with expert advice on product quality from the Taiyo-Yushi Corp., a company that produces high-quality soaps free of synthetic additives.